STA’-PUT® SPH is a solvent-based, non-flammable spray grade contact adhesive specifically designed to bond a variety of materials, including decorative laminate, wood products, molded fiberglass, galvanized steel, cork, glass, and many others. SPH exhibits high shear strength, heat and UV stability and water resistance. 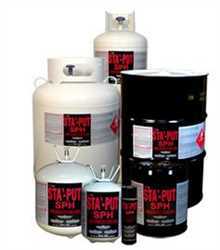 SPH also offers fast drying and a long open time SPH is also available in an aerosol can and a canister system.